Keep things going the next day: enjoy the sand and surf at Playa Punta Soldado Beach and then enjoy the sand and surf at Flamenco Beach. To see where to stay, photos, maps, and other tourist information, go to the Culebra day trip tool . 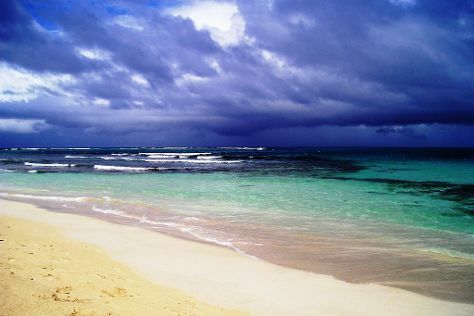 Washington DC, USA to Culebra is an approximately 8-hour combination of train and flight. You can also fly; or do a combination of flight, shuttle, and ferry. The time zone changes from Eastern Standard Time to Atlantic Standard Time, which is usually a 1 hour difference. Traveling from Washington DC in August, plan for somewhat warmer nights in Culebra, with lows around 80°F. Wrap up your sightseeing on the 21st (Tue) to allow time to travel to Isla de Vieques. On the 22nd (Wed), get engrossed in the history at Fortin Conde de Mirasol Museum and then explore the activities along Sun Bay. On the 23rd (Thu), you'll have a packed day of sightseeing: tour the pleasant surroundings at Caracas Beach, steep yourself in history at Puerto Ferro Lighthouse, and then kick back and relax at Media Luna Beach. To find where to stay, other places to visit, photos, and other tourist information, read Isla de Vieques trip planner . Traveling by combination of flight and taxi from Culebra to Isla de Vieques takes 2 hours. Alternatively, you can do a combination of flight, taxi, and ferry; or ride a ferry. In August in Isla de Vieques, expect temperatures between 88°F during the day and 79°F at night. Wrap up your sightseeing on the 23rd (Thu) to allow time to travel to San Juan. On the 24th (Fri), steep yourself in history at San Juan National Historic Site and then appreciate the extensive heritage of Old San Juan. To find other places to visit, more things to do, maps, and more tourist information, read our San Juan travel planning app . San Juan is just a stone's throw from Isla de Vieques. In August, plan for daily highs up to 89°F, and evening lows to 78°F. Wrap up your sightseeing on the 24th (Fri) to allow time to travel back home.